As the world pushes off for the summer, it is perhaps worth summarising the subjects which have proved of interest to those attending eDiscovery events so far this year. The attention in this article is on those I have attended, and on the UK and mainland Europe rather than the US. The focus is on the topics themselves rather than on any attempt to summarise what was said. This article ends with the hope that we will see more of the next generation willing to speak at events, for their benefit and the benefit of their employees, as well as for the audiences. Relativity Fest is now the biggest event in the UK (and EU) conference calendar, both by the number of participants and by delegates. I spent much of it recording video interviews, unwilling to miss the opportunity to capture so many people with interesting things to say, and my observation of the events was therefore limited. Many of those videos have been published in this blog. There was, of course, much which related directly to Relativity’s business – there was a TAR active learning overview, and plenty about eDiscovery in the cloud and RelativityOne. In both cases, the discussion has moved from “Should we do this?” To “How can we best do this?”. The older ones among us have seen this pattern in subject after subject over the years, as yesterday’s novelties become today’s accepted models. I took part in a panel called Rules, regulations, and roles: the law and your part in the eDisclosure process. The panel consisted of Mr Justice Birss, Ed Crosse of Simmons & Simmons, Karyn Harty of McCann FitzGerald, and Wendy King of FTI. David Horrigan of Relativity was the able moderator. Afterwards, I interviewed Ed Crosse and Karyn Harty about some of the points which had come up in the panel. The main focus was on the pending new disclosure rule for England and Wales in which Mr Justice Birss and Ed Crosse have been closely involved. We can expect more active “stewardship” of the disclosure process, enforced cooperation, and more transparency about costs. Karyn Harty brought the Irish view which finds the existing rules in England and Wales rather lax (I paraphrase), and puts the emphasis more on retrospective challenges to a party’s disclosure than on heavy control at the front end; we hear more of the lawyers’ “duty” from Ireland, and that is no bad thing to emphasise, along with the need for training of both judges and lawyers. Whichever way you do it, an understanding of technology-assisted review and of the benefits of eDiscovery in the cloud add a technical overlay to what is primarily a rules subject. In the early stages of planning for this event I made the cheeky suggestion that we mark the GDPR (due to take effect a few days later) by not mentioning it once during the conference. Unsurprisingly, perhaps, my suggestion was turned down, and one of the panels was sensibly called Your GDPR last-minute preparation checklist. In what has become a hackneyed phrase, but perhaps a useful one, the GDPR is a journey not an event, and compliance involves continuing effort, partly as best practices emerge and partly (in due course) as guidance and regulatory determinations are published. The most interesting panel, from my point of view, was called International disclosure, data privacy, US v Microsoft and the CLOUD Act. US Magistrate Judge James Francis IV (now retired from the bench) was on the platform, along with Rachi Messing of Microsoft. David Horrigan of Relativity was the moderator. It was Judge Francis who made the original memorandum and order in US v Microsoft and it is perhaps unsurprising that he is one of the most eloquent speakers on the subject – see my interviews with Judge Francis and with David Horrigan on this subject..
Two points made by Rachi Messing stuck in the mind. He invited us to unlock our phones or tablets, and then pass them to the person in the next seat. Unsurprisingly, nervous laughter greeted this suggestion, and nobody complied. We don’t like giving the keys to our data to others. That underpinned his next point, which is why it matters to Microsoft to preserve the confidentiality of those who entrust their data to Microsoft. A couple of days after Relativity Fest, I was in Milan to moderate a discussion organised by Rick Barker of business advisory company Accuracy. I wrote in advance about this panel here. I accepted the invitation because Accuracy are Relativity users. 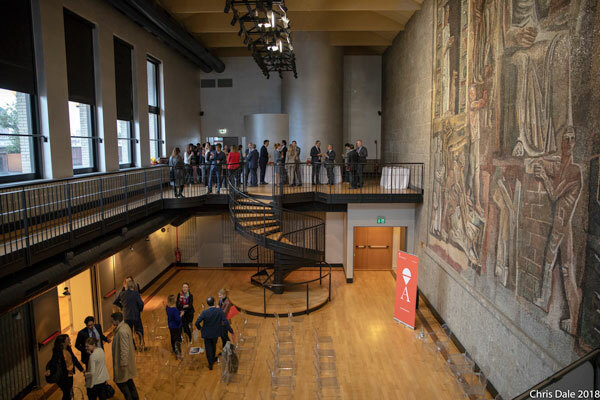 The event was held on the top floor of this Mussolini-era building, one of the more impressive of the venues I have spoken in, and with a view across Milan. The main speakers were Karin Holloch of Jones Day in Dusseldorf and Marilena Hyeraci of Paul Hastings in Milan, both of whom spoke eloquently about the use made of eDiscovery technology in relation to regulatory and other investigations into or involving EU-based companies. In opening, I explained that we in the UK had been relatively slow in adopting the technology which had been developed in the US to meet the demands of litigation under the Federal Rules of Civil Procedure. To some extent, perhaps, the zeal with which Americans shouted about their rules, their practice and their technology had been counter-productive, rejected by UK lawyers almost because of that shouted conviction that Americans knew best what was good for us. I was keen, I said, not to repeat that as we promoted the use of technology in civil jurisdictions. The point was not how we did it or how they did it in the US, but how other jurisdictions could benefit from our painful learning and our development of processes to tackle problems which (unlike the FRCP) are common to everyone. Karin Holloch and Marilena Hyeraci were eloquent in supporting this contention from their daily experience of managing large volumes of data for investigation and regulatory purposes. I would be happy to do more of these EU talks. Accuracy got a good turn-out of people who were interested in the business implications of what we discussed and who seemed to appreciate that we spoke more about opportunities than about risks and threats. Milan, by the way, was beautiful. I was the chairman for the two day Information Governance, Investigations, Compliance and eDiscovery event organised at Lord’s by IQPC. Jo Sherman of EDT has already written about this event in enthusiastic terms and I endorse what she said (albeit with due modesty about her kind comments for me). It is fair to say that this was once a much larger event, the largest by far in the UK, and a magnet for practitioners, experts and providers. It has been a more select gathering for the last couple of years (perhaps because Relativity Fest has assumed the top spot) but the quality of presentations and of delegates was, if anything, higher than in the old days. Back then the programme was split between a day on Records Management and a day on litigation eDiscovery, with large herds of Americans coming to tell us how to do it. The US input is more refined and useful these days, exemplified by the opening talk from James Sherer of BakerHostetler with a talk called How artificial intelligence is changing client practices as well as the practice of law, and what that means for eDiscovery. James Sherer’s examples were ones which travelled between jurisdictions. He reversed that defensive fear that technology would take work away from lawyers – used properly, it is an enabler of new work, work which matters to clients, is interesting to do and, he implied, profitable. The most interesting session for me was one called What is AI in disclosure and investigations? Views from civil and criminal perspective moderated by David Nichols of OpenText. The speakers were Nicola Woodfall of Travers Smith and Richard Day, a lawyer at the Serious Fraud Office. I wrote here about the SFO’s new initiatives with OpenText, and found it particularly interesting to hear Richard Day talk about how the SFO uses clever technology to fight its way through the ever-larger volumes of data thrown up by a big fraud investigation. Privilege is a particular problem in these cases, and using technology to abbreviate the time and cost of identifying privileged documents is important. Jo Sherman led panel on called GDPR is here. Now, get ready to rethink eDiscovery which emphasised the transference of eDiscovery skills and tools to things beyond disputes. I took part in a discussion with Karen Lust of Reed Smith on cross-border discovery considerations, including the GDPR, where the same theme emerged – how better will you identify private information than by using tools and skills designed for finding discoverable data? eDiscovery is not just rules and technology. Gráinne Bryan and Karyn Harty of McCann FitzGerald talked eloquently about what the eDiscovery lawyer will look like in 2020, with a focus not just on the type of people who will be needed but on the training and encouragement which firms must give if they are to breed the people they will need (as McCann Fitzgerald does to an exemplary extent). Disclosure in England & Wales was covered by Ed Spencer of Taylor Wessing and by Robin Ganguly of Bryan Cave Leighton Paisner. One was involved in the Pyrrho case and the other in BCA Trading, and therefore spoke about the subject with the authority which comes from first-hand experience. One of Ed Spencer’s themes was the importance of strategy and advocacy, the latter embracing the ability to argue for a particular approach to disclosure, internally with the clients, with opponents and, ultimately, with the court. Who would you rather make decisions about the conduct of of your disclosure? Would you prefer an approach thrashed out in discussion with your opponent, or one handed down by the judge? The star of the show for me was Paulina Jedwabska, Head of Information Governance and Departmental Records Officer at the Department of Digital, Culture, Media and Sport. UK government departments are not generally thought of as leaders in this field. Paulina Jedwabska’s secret, I think, lies mainly in an enthusiasm for her job which is infectious. Although their formats remain unchanged, these events were much more interesting than some of those of past years. We can to some extent now take the technology for granted, and the sessions about technology have moved towards how it can best be used to further business aims. Rules, whether of litigation or regulation, are better known than they used to be, partly because they bring increasing penalties but mainly because they have driven a closer focus on what really matters (I appreciate that there will be differing views on, for example, the front-end obligations in litigation). Most interesting, for me, are the people who will be carrying this work on – the willingness of younger people like James Sherer, Ed Spencer and Paulina Jedwabska to take part is cause for optimism for the future, as is the approach taken by firms like McCann FitzGerald towards bringing on the new generation. When I say “younger”, I mean “young” in a relative sense – with some experience to bring to the party, but with fresh ideas and styles of presentation. We need a new generation, not just to do the work but to carry out the messages to events like this. They in turn need the support of their firms or other organisations to encourage them to take on speaking engagements. Few people jump fully-formed into public speaking, especially on specialist or technical subjects, and we all benefit – the speakers themselves, their employers and the audiences – when knowledgable younger people get on their feet at events like these. The ones we heard at these events are themselves old hands by now. We need to be bringing on the generation after that. This entry was posted in Discovery, eDisclosure, eDiscovery, Electronic disclosure, OpenText, Relativity, Technology Assisted Review. Bookmark the permalink.